It's been a strange 24 hours or so in Obamaville: William Daley has abruptly left the White House and a new book details secret parties with fat budgets. But that's not all: PBS talk host Tavis Smiley has found himself disinvited to an upcoming King event over gentle criticism of the president and we've uncovered a peculiar incident that occurred during Smiley's most recent radio program. Yesterday's edition of the syndicated Smiley & (Cornel) West show featured Harry Belafonte detailing his ongoing unhappiness with the Obama Administration. HARRY BELAFONTE: When I think of Barack Obama and I think about all that is at stake here I’ve really long since left talking about how many terms he will be as a president. My question is what legacy will he leave having had the opportunity to serve under such hugely dramatic circumstances and boggled the mind and boggled people’s thinking and had such a huge impact on the universal state of things. And how could he have had such a splendid opportunity to do more than most presidents would have ever been able to do and he let that opportunity slip away from him. And I am very cautious of the fact of those who thinks that he has some hidden agenda and that if only he could be given a second term for us to see the new light new things will be revealed. A new efforts will be made to take us to a place other than where we have been and where we languish. I just don’t trust that. I don’t think that a safe way an accurate way to look at the scenario. I think if there was the kind of moral compass serving Barack Obama in the way we had all hoped, the moral force would have helped him make choices. The absence of that force in his equations the absence of that barometer to guide him when he has to make these decision which are hugely complicated, especially from the political perspective. He should have come to the table with things that I think would have helped us in this moment of crisis. So what's the problem, is it simply too close to the election? Is Smiley attempting to tone things down after the MLK disinvite? Or was it something in particular Belafonte said? If we find out you'll be the first to know. Harry has seen the light! Day-O, Day-O, Daylight come and Obama-go-home. The Black man had his chance and he blew it. He blew it for Blacks, Whites, Hispanics, and future generations. If he had any moral compass whatsoever he'd resign and allow someone with leadership take over. 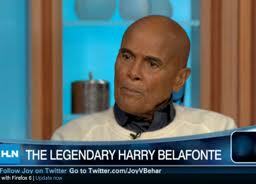 What a huge disappointment to hear this judgement by Belafonte. He started out with a promising statement with accuracy of the huge burdens under which Obama came into office, not caused by his party I must add because that is part of the equation perople must not forget so quickly. I'm sure people whose houses were saved would not agree with Belafante, nor the auto workers whose jobs were saved and the children who have been able to extend their family's insurance and continue to get health care. and their security of students loans. Obama has done a great many things for the country and presented a great many more but these were rejected by the party of "no"., and in the face of that Obama's moral compass was to try to compromise but not compromise things such as free lunches for impoverished children, and extend tax breaks for the middle class. If for one minute people are not proud for his ideals and would rather live under a tycoon such a Romney who bought up companies, fired the workers for the interests of the investors then they could most likely sit down with the weak intentioned Harry Belafonte who loves Hugo Chavez and hates America. Harry Belafonte is obsolete and the drudge report is downright evil spewing hate articles they have tainted, slanted for their followers who adopt the same policy of hate. I'm not a fan of President Obama's policies, in general, however it has to be said that he has an incredibly difficult job and it is such a shame for him that he gets such personally-hurtful criticism from all sides, even from his supporters. To some he's too left, and for others he's not left enough. He has it tough. Finally, some people (who can be fooled "all of the time") are starting to see that their emperor has no clothes. Obama was never about anything except personal ambition, and promoting a marxist agenda for the United States. work on mainly restructuring company's----Obama had a bland slate he could have accomplished so much.